Here we go again, another tow test. 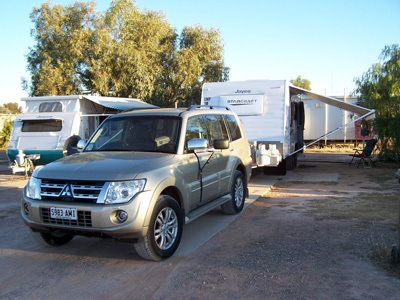 This time to put the current version of Mitsubishi's long running Pajero Wagon through its paces towing a 19 foot caravan in the NSW/QLD/SA outback. The Mitsubishi Pajero, in current guise, has been around for about 13 years and during that time has gone through some upgrades and panel changes. The most recent update being an engine upgrade to a 3.2 litre turbo charged diesel with direct injection producing a not unreasonable 147 kW at 3,800 rpm and 441 Nm at 2,000 rpm and matched to a five-speed automatic transmission. We were impressed by this engine and have dreams of it improving the already fine attributes of other Mitsubishi 4x4s, namely the Challenger and Triton. A six-speed auto for the Pajero, at some time, will potentially offer even better fuel consumption for the distance driver. Our drive vehicle, the range topping model, an Exceed is fitted with a reversing camera. A worthwhile gadget, I thought, especially during the hooking-up of the caravan. Not on this occasion, though, as the camera focus was 1.5 metres to the rear of the tow ball and could not be altered. Therefore, connecting the caravan relied on guess work and skill, well with a little assistance from bystanders (always available in caravan parks). Leaving our home base heading northwest we arrive in Dubbo NSW for our first overnight stop. Travellers here have the opportunity to visit the Old Dubbo Gaol, Western Plains Zoo and perhaps purchase anything left behind. We also refuelled here. We said goodbye to sunny Dubbo heading northwest again, for lunch in Nyngan, which by the way is almost the geographical centre of NSW. 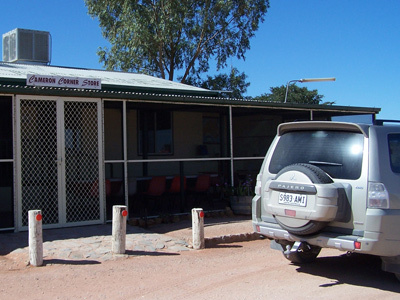 Then we head west to our night time destination in the mining town of Cobar NSW. Our directional headings mentioned here are not guess work thanks to the standard Map Navigation System fitted which also shows the precise GPS location at all times. Very handy information to have in an emergency. Very effective dust sealing is a big bonus! Still travelling west we leave Cobar on the Barrier Highway towards the major inland city of Broken Hill, NSW, but a visit here is not on the agenda for this review and we take a north westerly direction to the opal mining village of White Cliffs NSW. A fuel consumption test is not part of our review; however, whilst towing the caravan at about 90/95 km/h, at 2,000 rpm, we refuel at approximately 400 kms. Running out of fuel with a diesel engine is not an option. Without the van in tow about 700 km may be achievable. The village of White Cliffs had the first and only Solar Power Station in Australia which commenced operation in 1981 and supplied power to the local hospital, post office, some businesses, school and 14 residences. This power station remained in use until grid power became available in 1993. 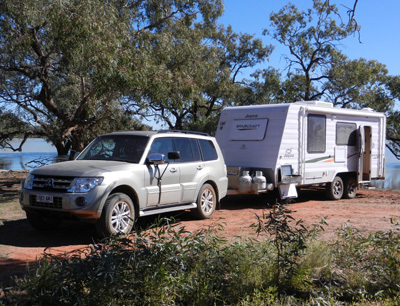 White Cliffs attracts a lot of caravanning fossickers who scratch around old mullock heaps looking for opal which differs from those found in Lightning Ridge, NSW and Coober Pedy, SA. The road travelled thus far has been on bitumen but we are soon to leave that all behind. Just 1 km from White Cliffs we hit the dirt road which is mainly constructed from the hard crushed rock in which opal is found. The Pajero was running 18-inch 6-spoke alloy rims fitted 265/60R-18 All Terrain radial tyres and these performed admirably and remained undamaged over the nearly 4,000 km travelled during our 3 weeks in the unit. The suspension system of independent multilinks with coil springs handled the terrain as if we were still on the black top. Covering 250 km at an average of 45 km/h the rough road and dust seemed endless, but the Pajero kept the dust out with really great seals around the rear door, however I can’t say the same for the caravan. 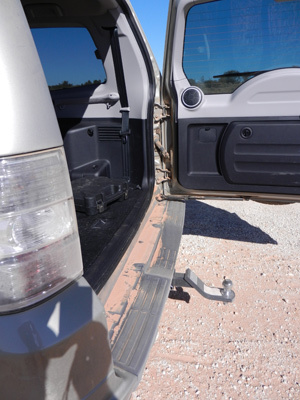 The Pajero's rear door glass dust deflector, a standard fitting, keeps the glass so clear that rear vision was never a problem (when the caravan wasn’t being towed). Eventually arriving at our destination of Tibooburra, NSW, the town has bitumen streets (all 4 of them) and the local caravan park was easily located. Having a fuel tank capacity of just 88 litres, a long range fuel tank would be a real advantage particularly while towing a caravan. Quoted fuel usage by Mitsubishi Motors is 9.0 L/100 km for the diesel power plant (non-towing figure on the combined cycle). Towing capacity for a braked trailer is 3,000 kg and 750 kg for an unbraked trailer. Maximum tow ball down load is 280 kg. On this occasion we did not use a weight distribution hitch or stabiliser bars, they were unnecessary and saved about 50 kg in weight. The caravan at 2,400 kg was perfectly behaved and did not waiver at any time, although a heavier van may have needed the aforementioned hitch of some sort. 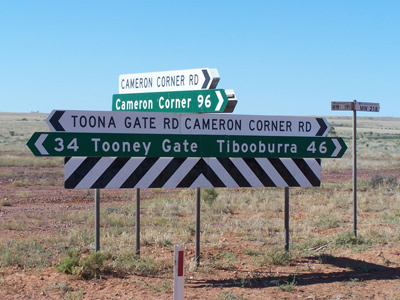 After speaking with other caravanners in the Tibooburra Caravan Park during ‘Happy Hour’ (a ritual for caravanners at about 4.00PM) about my travel plans we decided to leave the van in situ and do a day trip to Cameron Corner NSW, SA and QLD where the 3 state borders meet. 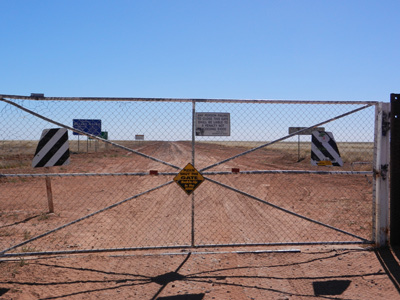 We left NSW through the closed Dingo Gate, entering SA then in micro seconds we were in QLD, not even enough time to blink and we crossed 3 state borders, how good was that? 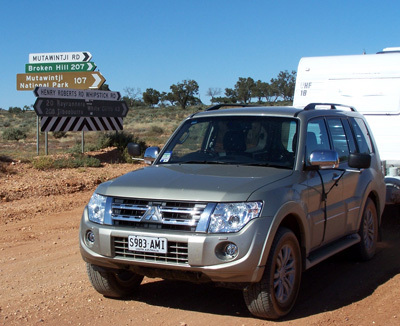 After lunch at the Cameron Corner Store it was back to Tibooburra via Fort Grey camp ground and lots more dust now dark red but it still did not penetrate into the Pajero, we were very impressed. 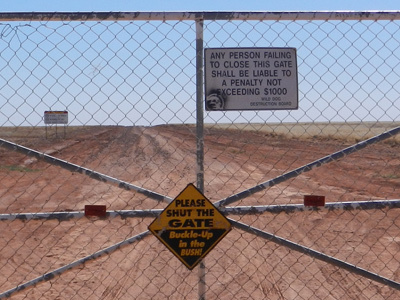 Spending 3 days at Tibooburra was interesting as the caravan park was well patronised by caravanners who come to fossick for gold around the river and creek beds with metal detectors. One such couple told me they find enough gold to pay for the annual holiday in Tibooburra of 3 months. On the road again heading north into Queensland, via the Warri Gate enroute to Nuccundra (just a handful of buildings make up this excessively tiny metropolis) on the main road, which is mostly deserted. Fuel is available here too. A free camping spot, is available on the banks of the Wilson River. A number of travellers were on duty as we passed by. Although free, the decent thing to do is to make a gold coin donation to the Royal Flying Doctor Service whilst staying at the camp site. This tiny community is some distance from Nockatunga, which is well off the through road. After some rest and relaxation it was on the road again, no there was not a Willie Nelson album playing in the audio system. 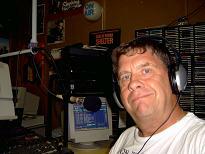 Standard equipment includes a single disc CD player. The surround sound system was in itself excellent, through 7 speakers the beat comes through loud and clear. The DVD sound track vibrates out unless using the wireless headphones for the rear seat occupants. We are easterly heading now having joined the Bulloo Developmental Road or Adventure Way as it is also known, to Thargomindah, QLD for our next overnight stay. Time in our drive package is starting to come to an end as we head to Bourke NSW via Cunnamulla, QLD for our night stop-over. A famous Australian, Dr Fred Hollows (the eye doctor) is buried in the local cemetery of Bourke. Arriving after dusk, it was a quick set up to attach water hoses and power lead to the van. The jockey wheel was attached and lowered to relieve the weight on the hitch/rear suspension for quick start the next day. Leaving Bourke it was a left turn travelling east on the Kamilaroi Highway through Brewarrina and Walgett without stopping. The wire mesh shutters over all the store windows and doorways puts us off a bit. We found a very pleasant road side stop about 10 kilometres out of Walgett for a lunch break with some other vanners. Our direction has changed a little to the south east and a noticeable change in the air temperature was felt, starting to get cooler. Cotton plantations and farms line the Kamilaroi Highway all the way to Narrabri where we set up for our 2nd last night on this excursion. Night time temperature in May of 4 degrees Celsius is tad cool for me. The drive through the cotton crops being picked by machinery that came from transformers was the scene all the way to Gunnedah NSW and on to Tamworth for our last night on this trip. Tamworth is known as the Country Music Capitol and for being the first town in the southern hemisphere to have electric street lighting. Home again, our time in this pleasant to drive, well-mannered machine is over. The package performed flawlessly in everything thrown at it, rough roads, dust, but no rain or flood waters. Is this package flawed? Well, yes, it is in our minds. However, we are probably being picky. The rear door mounted spare wheel prevents the door from being opened more than 10mm while a caravan is hitched and we would like to see the rear view camera have more flexibility in where the lens can be directed. The single-disc CD player could be unpopular with unaccompanied long distance travellers although there is always iPod, a connection is available in the Exceed version. This test package EXCEEDed (no pun intended) our expectations and for the astute thrifty motorist it should be due for consideration as a most capable tow vehicle. So put this model near the top of the ‘I want’ list. Metallic or pearlescent paint is optional at $495 on each model. Numerous other options are available. The Next Car team likes the competitive pricing structure for the Mitsubishi Pajero. NOTE: * Manufacturer's List Price (MLP) excludes dealer delivery fees and the numerous statutory charges (commonly known as on-road costs). Additionally, please note that all prices, fees and charges are subject to change without notice, as are the specifications. Luxury Car Tax (LCT), when applied, is effected when options are added to the car. More Mitsubishi News ..... here.